Liaison office- Liaison office do not have any separate legal entity. It is considered as Foreign Company in India. 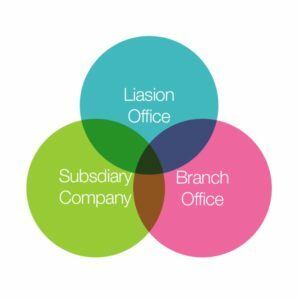 Branch office- Branch office do not have any separate legal entity. It is considered as Foreign Company in India. Wholly Owned Subsidiary- Wholly owned subsidiary company has Separate legal entity & it is considered as Indian Company. Parent Company shall have a profitable track record during immediately preceding 3 years. Parent Company shall have a profitable track record during immediately preceding 5 years. The Net Worth of parent company shall be not less than USD 1,00,000/ or its equivalent. Wholly Owned Subsidiary- There should be minimum 2 subscribers & 2 directors for registration of wholly owned subsidiary company. There is no minimum criteria for capital induction. And no requirement of track record of parent company. Liasion office- For liaison office registration, prior approval of RBI is required to enter into any business contracts. Branch office- For Branch Office registration, prior approval of RBI is required to enter into any business contracts. Wholly Owned Subsidiary- Approval for wholly owned subsidiary company registration is required from ROC. Further intimation to RBI is also required for issuance of shares to foreign holding company. Liasion office- Liaison Office Registration License is available for 3 years, it can be renewed further. Branch office- Branch Office Registration License is available for 3 years, it can be renewed further. Wholly Owned Subsidiary – Private Limited company registration by foreign company is normally for perpetuity. It can operate till the closure of Indian company. It can promote export / import from /to India. It can promote technical/financial collaborations be­tween parent company and companies in India. It can act as a communication channel between the parent company and Indian companies. To carry out research work, in which the parent company is engaged. It can promote technical or financial collaborations between Indian companies and parent or overseas group company. It can represent the parent company in India and acting as buying/selling agents in India. Providing services in Information Technology and development of software in India. Wholly Owned Subsidiary- It can do activities as per its Memorandum and Article of association. Liasion office- The entire expenses of LO will be met from the funds received from head office through normal banking channels. Branch office- The entire expenses of BO will be met either from the funds received from head office through normal banking channels or income generated in India. Wholly Owned Subsidiary- The income of WOS will be generated from business activities. Liasion office- It will be managed by Authorized representative of parent company in India. Branch office- It will be managed by Authorized representative of parent company in India. Wholly Owned Subsidiary- The WOS will be managed by Minimum 2 directors and one of whom shall be an Indian Resident. Liasion office- Remittance of profit required only in case of closure of LO. Branch office- Profits can be repatriated/transferred to parent company subject to applicable taxes in India. Mode of Remittance of profits. Liaison office- There is no criteria for meetings. Branch office- There is no criteria for meetings. WOS gives a separate legal entity whereas the BO/LO has no separate entity. The liability of parent company is limited to the extent of its shareholding in the Wholly Owned Subsidiary (WOS) On the other hand the liability of the Branch is unlimited. The assets of the parent company are at risk of attachment in case the liabilities of the branch exceeds its assets. WOS can expand its business activities by altering its Memorandum of Association On other hand BO/LO cannot expand its activities or undertake any new trading, commercial, or industrial activity other than that is expressly approved by the RBI. The overall advantage for both parties however, in forming a wholly owned subsidiary; are that the subsidiary can retain its name brand.